Notwithstanding all of these difficulties, School #299 still does well in secular academic competitions. Rabbi Bleich was persuaded to reduce Jewish studies classes from ten or more per week in the upper grades to six per week, a total that is more suitable for youngsters from secular homes. Good teachers are loyal to the school and remain on faculty, even though they are paid late sometimes and they do not receive the bonuses that are common in other schools. Through Mr. Gilgur's own connections on the city district council, he has been able to obtain certain equipment for the school such as smart boards, new computers and related equipment for a fully-equipped computer studies classroom, and new furniture and toys for the preschool. 37. The Simcha-Chabad Jewish Academy was established in 1992 by Berel Karasik, then a Chabad-associated local leader in Kyiv. The two-building institution is located in the Dniprovskiy district of the city, on the east bank of the Dnipr River. Simcha is affiliated with Tsirei Chabad (Young Chabad), an Israel-based faction of the Chabad movement. The school receives no financial assistance from Ohr Avner, the educational arm of the Chabad-controlled Federation of Jewish Communities. The writer spoke with Rabbi Mordechai Levenhartz, director of Tsirei Chabad programs in Ukraine. Rabbi Levenhartz stated that, after several years of decline from a peak of 540 pupils in 2007-2008, enrollment in grades one through 11 appears to have stabilized at 252. Additionally, the Simcha preschool enrolls 90-95 children. Of the 18 graduating eleventh graders, he said, most will enroll at various Kyiv colleges; however, several intend to enroll in the Sela (university-preparatory ulpan) program in Israel and establish their adult lives in that country. Simcha pupils come from all over the city, said Rabbi Levenhartz, transported between their homes and the school by chartered buses. Overall, he continued, families seem somewhat poorer than in previous years. However, a local donor has provided significant funding for upgrading math and science curricula, including teacher training and new textbooks in these subjects. The donor also is supporting some extra-curricular activities as well. In response to a question, Rabbi Levenhartz said Simcha has 15 useable second-hand computers provided by donors several years ago, but it lacks necessary software and peripherals. Rabbi Mordechai Levenhartz, an Israeli, is respected in Kyiv for his broad, communal approach to Jewish education. Another donor, stated Rabbi Levenhartz, provides security for the school. Faced with continuing assaults and damage from drug addicts and neighborhood toughs several years ago, Rabbi Levenhartz successfully raised funds from a number of donors for a fence enclosing the schools and for 24-hour security guards. Simcha has suffered no further attacks since the fence was installed and the security guards assigned. He is now seeking funds, Rabbi Levenhartz continued, for new roofing. Replacing the roof in one building will cost between $15,000 and $16,000, he said, and current funds do not permit him to undertake such a major project. It is a constant struggle (борьба) to allocate fund between competing needs, such as food for pupils and maintenance, he observed. 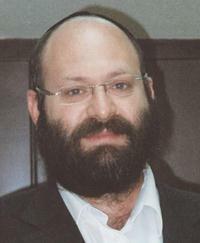 In response to a question about a rumor circulating in the city regarding a possible merger between Simcha and the Mitzvah school, an institution operated under the auspices of Rabbi Moshe Asman of the Brodsky synagogue, Rabbi Levenhartz said that some discussions had been held, but he thought it unlikely that a merger would occur soon. He observed that Mitzvah always was a very small school and had very few students in the upper grades; however, the school is a personal project of Mrs. Asman and she is unlikely to agree to close it. Also, he observed, the two schools are far apart within the boundaries of Kyiv so it is unlikely that an arrangement could be made in which the lower grades of the merged schools could meet in one facility and the upper grades could convene in the premises of the other school. Simcha has not operated its own summer camp for some years, Rabbi Levenhartz stated in answering another question. It no longer had the funds to do so. He refers pupils to camps operated under the auspices of Rabbi Moskovitz of Kharkiv, Rabbi Wilhelm of Zhytomyr, or the Jewish Agency for Israel, he said. Acknowledging widespread poverty in the neighborhood in which Simcha is located, Rabbi Levenhartz operates a strong welfare program alongside the school. His community supports a synagogue in one of the school buildings that provides a hearty kiddush meal after services in order to feed impoverished local Jews. The community also conducts its own patronage service, that is, it assists homebound Jewish elderly with cooking, shopping, and cleaning. JDC, Rabbi Levenhartz stated, gives him a list of local Jews who need help, but the organization does not offer any financial assistance for provision of these services. Rabbi Levenhartz also operates a subsidized kosher store. Although times are bad, Rabbi Levenhartz observed, some local Jews still contribute funds to his various programs. He still has sponsors, he said, and considers such assistance nothing short of a miracle (чудо). 38. The Perlina School is an independent, private Jewish day school currently enrolling 120 youngsters in from preschool through grade six (ages 2½ to 12). Classes are small, numbering no more than 15 youngsters. Perlina receives no government aid, but charges $600 monthly, said Rabbi Yonatan and Mrs. Ina Markovich, who operate the school. The monthly tuition fee is typical for good private schools in Kyiv, the Markoviches said, but only about 30 percent of children come from families who pay the full fee. Scholarships for the others are supported through fundraising. One rabbi and two Hebrew teachers oversee a Jewish studies program that includes five lessons in Hebrew every week, two lessons in Jewish tradition, a kabbalat Shabbat (receiving Shabbat) session on Friday afternoons, and activity in Jewish culture that is led by the Jewish Agency. Almost all pupils are halachically Jewish, said the Markoviches, although some parents and children are in the process of giur (conversion). However, the Markoviches continued, one of the primary attractions of Perlina is its strong English-language program, which includes daily lessons in English as well as English-language instruction in geography, history, and science. Typically, they said sixth-grade graduates of Perlina continue their education at other elite private schools in the city, particularly the British, American, and International schools, all of which teach in English. The school day at Perlina begins at 8:10 a.m. and ends at 4:45 p.m., said the Markoviches. The school has a computer classroom with 15 workstations, and a number of classrooms have smart boards connected to the Internet. Perlina currently is operating at capacity. In theory, the school could be expanded to add more grades or add more classrooms to existing grades, but school renovation and expansion are very difficult in a society with rampant bureaucracy and corruption. The bureaucracy is "endless" (безконца), said Rabbi Markovich, although it is likely that most of it could be resolved with bribes, he observed. However, he noted, Perlina would end up paying multiple times for any renovation or expansion that it would undertake; because the school building is rented from the city, improvements to it would entitle the city (according to current regulations) to demand increased rent for the improvements, i.e., for upgraded and additional space that the Marko-viches and their supporters would develop themselves. 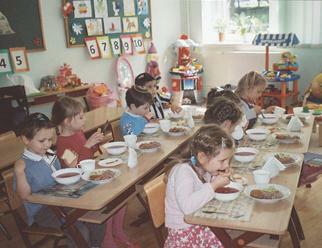 Younger Perlina pupils eat lunch that is brought to their classrooms. Older students eat in a designated dining hall at tables seating four to six pupils. Rabbi and Mrs. Markovich stated that a major objective in transforming Perlina from an ordinary Chabad school to a fee-dependent private school is that such transformation "makes Jewish schools respectable." Children of some Kyiv middle class and wealthy Jewish families are indeed enrolled at Perlina. 39. Schedule conflicts prevented the writer from visiting the ORT school, a lyceum with a competitive admissions policy that enrolls approximately 250 youngsters in grades five through 11. Unlike the Perlina school, the ORT lyceum enrolls youngsters from lower and lower-middle class families. The preschool enrolls children between the ages of three and five. Following kindergarten, the children from religious families will enter the yeshiva katana or the Beis Yaakov school, not regular classes at School #299. See pages 79-80 for information about Rabbi Asman and the Brodsky synagogue. The Markoviches also operate a school for autistic children. See pages 66-67.